This article on the Facebook Marketplace was originally written in 2014. And, WOW have things changed since then! Please see my updated notes at the bottom for new tips on buying and selling in the Facebook marketplace. Today I was on both B105.7 and Indy Style talking about the latest thing to hit Facebook: online garage sales, or the “Facebook Marketplace”. Are you a part of any Facebook Marketplaces in your area? I’d estimate I’m in 20 different marketplaces in my county, ranging from furniture & home goods to crafts & homemade items, and everything in between. Whether you’re new or seasoned, I have some tips from buyers and sellers, and even from a couple of group administrators that can help you get the most for your money, completely headache-free! 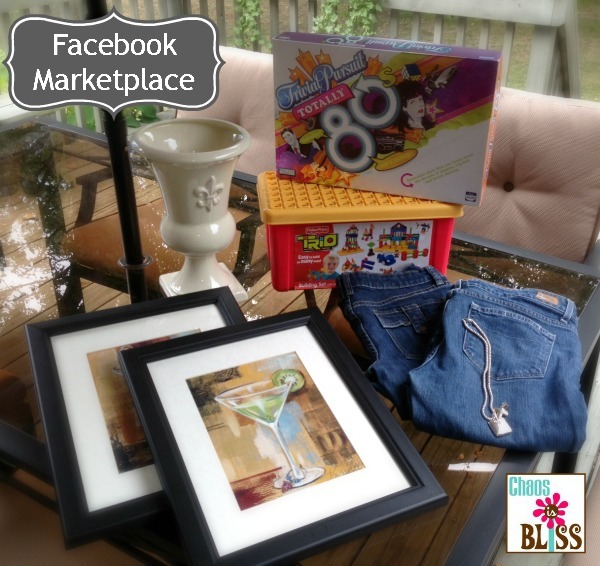 How do you get started on a Facebook Marketplace? It’s really all about who you know! Sometimes they begin city- or county-wide, and when memberships become so large it can become difficult to manage, so administrators may choose to break off by category. Do some research, poll your friends on Facebook and if they’re a part of a marketplace, ask them to invite you. Many groups are “closed” or “secret”, requiring an admin to approve potential new members. Admin tip: Read through the group policy, usually pinned to the top of the group page. Some will not allow you to cross-post, meaning post the same item in different groups. That just opens up a whole bag o’ crazy trying to keep track of who was next in line! Admin tip: Watch several transactions take place before jumping in. See how the conversations flow, ask questions. Take a decent photo: The best photos have a contrasting, solid background – crop out your spouse/kid/dog sleeping on the couch and potato chip bag on the coffee table, please! (I’ve seen it, for reals). 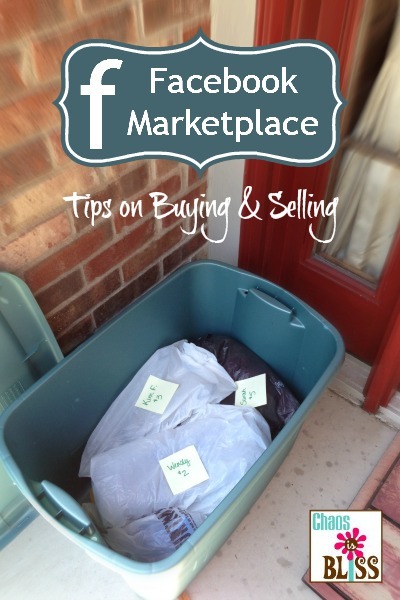 Price your items to sell, at or slightly above garage sale prices. That gives you a little wiggle room for negotiating, but probably 75% of what I have sold the buyer never asks to if I would take lower. Post in the correct category: Don’t post a blender in women’s clothing because you think women would be the one wanting a blender. #Seriously. Be quick in responding (also when buying): This is simple courtesy. No one wants to get excited because they’re the first to respond to a deal, and you don’t get back to them for 48 hours. See the group’s rules for acceptable timeframes. And have grace, not everyone is mobile and can respond in 15 seconds or less. Meet in person off-site for higher priced items. I’m sure this goes without saying, but don’t leave cash laying on your doorstep for 10 hours. If you work from home or stay at home, you might be comfortable with leaving your sold items in a tote on your porch and collect cash once the item has been picked up. Otherwise, find a safe meeting spot close to home to make your transaction. Here’s an example of a perfect Facebook Marketplace transaction. The seller posted details of her item, her general location, and price. Someone responded, then the seller replied that she private messaged the first responder. One additional person expressed interest by commenting “Next”. If the first buyer passes, the seller will go to the next one in line. Line jumping is not a sport on the marketplace! If there is more than one person ahead of you, simply put “in line” in your comment, and any respectable seller will move down the list, in order, should the first responder pass on the item. Don’t type in “Quick pick-up! I need this item ASAP because my dog is dying and my car broke down and my boyfriend/girlfriend/husband/wife left me.” Wait your turn like everyone else. Do any bartering before pickup. Some like to do this via a Facebook private message. Inspect item upon pickup. It’s ok to pass! Learn the terms: Similar to selling on eBay or Craig’s List, learn the terms so you know what the heck people are talking about. PPU = pending pick-up; EUC = excellent used condition; NWOT = new without tags, etc. In this photo (above), you can see some examples of items bought/sold on the marketplace. I bought the two framed art prints (still with $29.99 price tags on the back, each) for $4 each to go near our bar in the basement. The two pairs of jeans are a prop I borrowed from my neighbor, and she paid $10 on the Facebook marketplace for the Paige jeans (retail $150-$200) and $5 for the Limited jeans (retail $50-75). Is it time consuming? It can be. Factor in your time taking and uploading your photo. Turn off your notifications so your Facebook newsfeed doesn’t become inundated with marketplace deals. And some do complain that there are no-shows when an item is scheduled to be picked up. Is it safe? I believe so, especially when you can meet someone off-site if you are concerned in any way. As with any online communication or transaction, be smart. One admin told me she’s seen people put their street address within a comment (instead of private messaging). That would be not smart. Is it fun? Yeah, I’ll admit it’s pretty fun! I sell most of my kids’ clothes and toys through Indy Kids Sale twice a year, but I have had some decent success with home decor, household items and my own clothing. I save up my cash from selling for some “fun money”, spending it on shoes or a purse, you know, girlie things like that. Another friend of mine sold her entire living room furniture set through the Facebook marketplace, and used that money to put toward her new set. You can view the video clip from today’s Indy Style segment and hear audio from B105.7 over on my media page. After reading through my original article dating back to 2014, surprisingly many facts and nuggets of wisdom are the same. Play nice, wait your turn, don’t be a line jumper and show up if you agree to meet. Facebook has now changed the look of these groups and the look of posts themselves. When it first became a “thing”, buy/sell posts looked much like your standard Facebook post in your newsfeed. Now, there are sections for item name, price, location and description. You can also see from the blue callout box, that now when you post to a group you have the option to select more groups or even “THE” Marketplace. By increasing the number of groups your item is posted in, more eyeballs will see it and it could potentially sell faster. Another change … messaging buyers and sellers to communicate around a possible sale is super easy. Under the item’s photo is a box that says “Message Seller”. And when you have possible buyers indicating their interest in a comment, right under the person’s name is “Like”, “Reply” and “Message”. And, if you choose to lower the price it will put a slash through the original price, the original price is red and the new lower price is in green. This is a nice, eye-catching change. 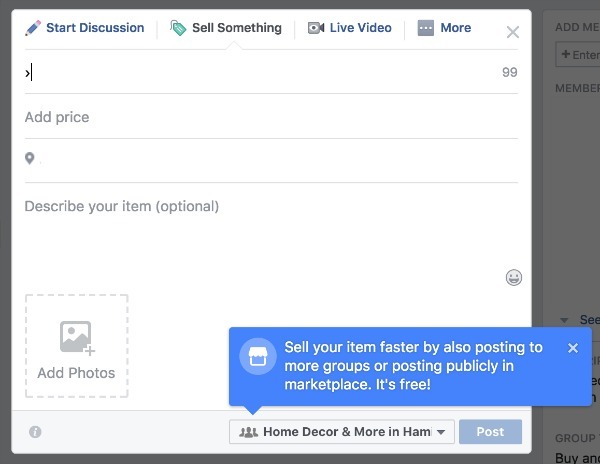 I hope you found these Facebook Marketplace Tips helpful! Do you participate in Facebook marketplaces where you live? What’s your take on them? This post was originally published on May 16, 2014. My area has a bunch of Facebook “garage sales” and “auto sales” groups that I’ve been using for quite some time. I’ve had very good luck so far and I’ve bought n sold a bunch of items off of Facebook. very surprised that you would give a stranger your street address, I guess it is similar to a garage sale. I have had great luck selling in several Facebook marketplace sites. I always meet in a public place with some traffic, and try to avoid night/evening meetings. Hi Sherry, thanks for your comment. For big-ticket items I would definitely meet in a public place. But for something of smaller value, yes I’ll give my address because the groups I’m in are all within my town or county, and it’s the “6 degrees of separation” factor – generally we’re linked to someone I know, so it’s never been a problem (knock on wood!). How do you find out what group the item was posted in? I message sellers and don’t get responses.id like to go to the page and comment. I’m new to Market Place but I can”t figure out how to get my items back to the top of the post after being online for several weeks . Suggestions ? Is it safe for me to answer a person regarding a possible purchase by their e-mail address? If you feel unsafe you might set up an alternate email address that doesn’t use any form of your name. I’ve done that for selling on Craigslist. Hi Mari, I don’t believe that is in place with Facebook, good question! I Have Been Buying Alot of Christmas Gifts From Marketplace! And I Am Still Looking For Junie B Jones Books or Sets Possibly in Wrightsville, Hellam, Yorkana or East York! My Youngest Granddaughter Zoe! So Everyone On Marketplace Could You Please Post Them On Marketplace So I Can Get Junie B Jones Books For Either Her For Her Birthday Which is Next Thursday or For Christmas!!! Thank You Everyone I Really Appreciate It Very Much! Deb ? 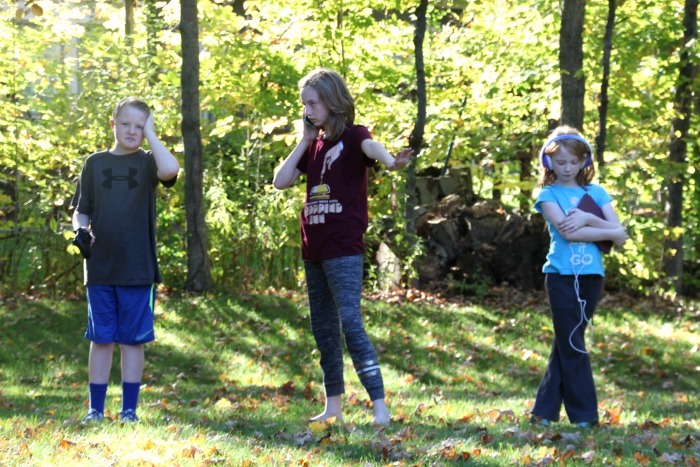 Good luck – I’m sure you’ll be able to score some Junie B Jones books very soon! You might also check Half Price Books if you have one near you! I’m new to the FB marketplace and just recently started posting items for sale. I’m curious why people post a like or thumbs up in the comments for your item and nothing else? I’ve responded to a few of these posts asking if they were interested in setting up a time to look at an item or to purchase but I usually never get a response that they actually want to buy the. I’m just wondering why so many people do this? Hi John, I wonder if it’s a way they can track posts that they “like”, to maybe scroll through and find later? Anyone can follow a post by clicking the drop-down arrow and choosing to either “Save” the link or “turn on notifications”. It’s definitely odd! Does the seller know you “saved” their item.? How do I report a seller that did not sell something to me when the deal was setup then insulted me? I have posted quite a few items, jewelry and art, I have sold one ring. I can not find any of the other postings I put up. How do I find where they are or do I repast everything? When browsing items, I cannot change the price parameters! This is incredibly frustration when there is a vast price range for a product, scrolling through hundreds of posts that are irrelevant to me. There is a drop down menu that says “price,” and I click it and input my range and click apply… and nothing happens. Please, for the love of god, what is happening here? My wife used to sell many items on Marketplace. Recently she got bumped off and when she tries to get back on she gets a message asking for a copy of photo ID. Is this normal? I am afraid someone has hacked her and is trying to get more info? Hi Glenn sorry I’m just now seeing your comment. That certainly sounds scammy to me – or perhaps a virus? Hopefully by now you’ve gotten it sorted out! Glenn someone hacked her account. They (Facebook) will never ask for your photo id. Thanks for this! Any way to get rid of the suggested auto replies that show up for buyers (such as “interested’, “next”, etc)? They are terribly annoying to me! Ha! That is a newer feature. I haven’t found one but please pop back here and share if you find a way to turn those off! Hi, I just posted my bike for sale. Few buyers contacted me. Next 2 person were ready to buy it. Somehow I didn’t trust 1 buyer from that and sold to another one. Now that person whom I didn’t trust is harassing me and telling she’ll block me from marketplace as her sister is a Facebook admin. And also forcing me to use Craiglist. She used harsh language but I never replied to her messages. Is there really anyway someone can block me from marketplace? Is there anyway I can give a proper reply to her? Hi Ann-Marie. Thanks for your reply. I’m sorry for replying late. That lady didn’t message me again nor my marketplace is blocked. Guess she was just forcing me to use Craiglist. Anyway, I didn’t report that conversation. I think I have been scammed by a seller- She did not show up on 1st agreed meeting time. She said she had a flat tire. Then at the agreed 2nd meeting she was one hour late,! Then on my 2 nd purchase she did not bring the agreed upon items . She said she forgot the box they were in. She brought other items to sell. I purchased a floor puzzle that only had 35 out of the 45 pieces. Also the Vtech camera which needed batteries did not work. I text her message to say that they were defective. She replied that she apologized and asked what she could do to make things right.I I said I would return the items and get a refund. She never responded & pulled her post from Facebook marketplace- There is no way that I can report her! Plus she is not the person in the profile. She said it was her sister & she was helping her out. I have tried to find out who the administrator for marketplace Columbia, MO. Hi Kathy, I wouldn’t call a no-show or arriving late a scam. Unorganized, chaotic, space cadet … possibly! Heaven knows I’ve been guilty of all that. It is definitely poor taste if the floor puzzle was missing ANY pieces, and absolutely untrustworthy that she’s sell a known broken toy. I would report her to the marketplace group admin and explain what happened, perhaps others have had similar trouble with this seller. Hi! Is it legal to specifically post to private message seller instead of commenting? It’s just that a buyer “reprimanded” me (yes that’s the term as she scolded me thru fb messaging about how i was not responding to comments and suddenly post my items as sold, even accused me that i was reserving it for personal friends and not the first in line). I cross post all the stuff i am selling but i always put to message me because i cant keep track of all the comments. I work the night shifts and i can only see everything that went on in the evening. That’s why i prefer to message as I would know who came first. I just did not think someone would be offended when I clearly stated in my post to message me. I did not know it was clearly not allowed. 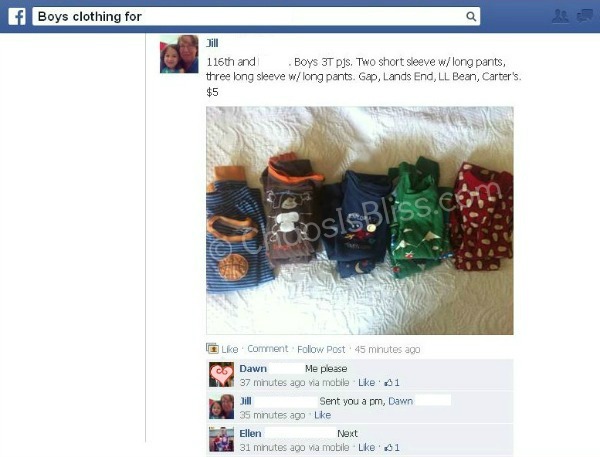 Hi…..I was abruptly blocked from Marketplace & local yard sale groups without any notice or reason. Have sent multiple appeals, requested help at least 50 times from help community & still blocked. Only replies I e received are that my appeal was successful & my feedback helpful to Facebook community. I see posts in the help community from hundreds of people all blocked. This is my source of income. Please help intervene. One of the groups I’m involved in is a pay it forward site. I give away what I cannot sell. How can this possibly be happening? Marketplace presented themselves to me to sell & then blocked me from everything. Who is in charge to fix this? I wouldn’t rely on the Facebook marketplace to be a primary source of income. It could go away at any time without any notice, just as any online site could. Any tips you could give to a spring-cleaner giving items away for free? How late for a pick up does someone have to be before I move on to the next in line who wants it? I left another online buy/sell site cause I didn’t give each “interested” party 12 hours to respond or show up, and suffered ridiculous backlash from people feeling somehow entitled to my items. I’d rather not just toss it at the backdoor of Sally Ann, but I’m starting to feel held hostage in a weird way by people on these sites. Hi Natalie, do you mean you make arrangements to meet and the buyer doesn’t show? When that has happened to me, usually they call or text with an apology and an explanation. You can decide from there if it’s worth your time to try again, or to just move on. Same issue. A buyer was interested in an item and wanted to meet over the weekend. Had two other offers for the item and asked the original buyer “Are you still interested?” and have not received a reply in almost 24 hours. Is it safe to move to the next “very interested” buyer, or will that get me banned? Hi Laura, I would most definitely move on after 24 hours and can’t imagine why that would get you banned. Good luck! I bought something, sent money via PayPal, sender did not send. What do I do now. It was $200. Yikes! I’ve never ever paid a stranger through PayPal. And traditionally the Facebook Marketplace is designed to meet the seller not for them to mail items. If you’ve already tried contacting the seller, I would go through PayPal to reverse/block the payment. Good luck. I’ve seen some posts marked “pending.” I could make good use of that but can’t find it. Can you help me with that? Thanks. I’ve never thought about using Facebook as a place to buy and sell things. It’s always been sites like Craigslist. Thanks for sharing and reminding me of Facebook. I do see the ads encouraging me to buy/sell things on there. I need to sell a few things before I move! I listed in item at a lower price than I should have gotten A beyond overwhelming response of people interested, I should have listed for a higher price originally. Am I allowed to raise the price since so many people want it ? It’s not an auction, so no it’s not cool to raise a price after you already have interested parties. You would be at risk of getting banned from the group (and perhaps angry messages). New to FB market place, thank you for this information. I posted something lest night on multiple sites. First contact is picking to item up. So I changed item title to PPU (pending pick up). I also posted on the other sites where I received “interested” messages with a Thank you PPU. I was just scolded by a women who posted first on one site, but after the 1st buyer, that I should ave included POOS in the description, assume it means posted on other sites. I didn’t know it was a thing and didn’t see it mentioned in this post. I apologized and explained I’m learning. Disappointing that she just didn’t direct message me! Jan st want to share if posting on other sites! Thanks again! Why oh why can’t people offer grace and kindness. That stinks she was rude to you! But thanks for bringing this to my attention, I’ll take a peek around and see if I’m seeing more of the “POOS” and update my post. Anne, I need to ask you a question? OK I am a member to a a buy/ sell group in my local area. It is listed as Eugene buyer/ seller group. Well another member listed some home storage crates, so I responded and said I would like to buy. He responded back to me and wanted to know when I wanted to come purchase them, I said tomorrow, which was yesterday. OK he said he wasn’t going to be home and I said could I come by and leave the $ 15.00 bucks under his door mat. He said yeah that would be fine. Okay after I put money under the door mat , I proceeded to pick up crates as I bent over my keys slipped out of my hand and landed in a wicker basket. So I reached in and retrived them from it. I dropped them in the crates and picked them up. Pm seller I had picked up. Thanked him and left. He pm later saying I better return the $5.00 I stoled from the basket. I replied back I don’t know what he is talking about, I put the money 15 under the mat. He said no the $ 5.00 I took. I replied and explained what happen, he called me a liar and sent two home video shots of me bending over and reaching in the basket. I replied you can see my keys in my hand. I told you what happen, he said I have reported to administrators and will be showing footage to them. Then his wife pm saying I am lying and I better return the money, said cameras don’t lie. Said I eyeballed money twice and scooted the crates over several times and stole the money and dropped it in the crates, I said no that I had dropped my keys in them. Itold her I don’t lie and I am not a thief. She said they were contacting police and I better not come around again etc. Then the husband pm said they had forwarded this to administrators and would be turning it over to police today. I did not steal anything and it pisses me off. So can you advise who to contact? Thank you! I’ll have to check this out more as I’m not on Facebook a whole lot. One of the things that I do like that you mentioned is that there are categories for pretty much everything. I do have a bunch of stuff that I think could benefit from this so I can free up some space. Now I didn’t see this on there but do they have a spot for houses and things like that? I have lost several potential buyers because I told a buyer that the item would be held for them. Then they do not show up. I let the people know who were interested the item is available and they are no longer interested. a How long should you wait for someone to pick up? I need to ask a question about selling on Marketplace. The item I had listed was renewed, but didn’t sell. After the 5th renewal ,they said I could not renew again. I had an interested person who said she would check later, but when it wouldn’t renew, I lost her info. Any way I can get into my previous message from her, so I can contact her? Also. When renew is up, to put item back on,do I have to start all over again? I am a buyer who is being asked to pay for a very expensive piece of furniture 2 hours before delivery so the seller can dismantle the piece and prepare it for pick up. I am being asked to pay $8000 in advance! I certainly don’t feel comfortable doing this. My kids are selling a home, but when I put my location as a City 40 miles away and request to see homes with in 100 miles it does not come up. Do you know why? From 2015 to ID say about August 2018 I posted and sold on FB Markerplace for local pickup. Then after August for some reason things started getting weird. Tons of emails from potential buyers (some profiles in Syria, Afghanistan etc.) and you can tell these people are something. Bad. Also, I price my stuff very reasonable so there is no need to haggle. They want to pay $8 for a $55 table. I don’t know what has changed-people want all the good stuff for zero dollars and it is a complete waste of time going back and forth with them. Sometimes I think they are playing with me when they finally tell me they are in another State 4 hours away – hello I put my location on there. I give up!!! Just got an Antique Booth where I can can stage and put all of the things in there and walk away. Who has time for this nonsense! What is it they are really after? To steal your information? Hi I only use marketplace on my iPhone. ‘Marketplace Tips’ are now showing up when I choose to message a seller. I don’t need to see these same tips after I’ve looked at them once. It changes the way I am able to message the buyer as it blocks that space where I’d type. It’s a real challenge to message the seller or when I can start the message, it doesn’t let me see all I’ve typed. Any way to turn off the tips notification? I have posted on Facebook Marketplace and have had great experiences so far but i need to lower a price and If I go through the “manage” button on the item to “edit post” (when I change my price, it doesn’t show the green slash through the original price that indicates the price has been lowered. How do i make this happen? Any help you can provide is greatly appreciated. I’ve seen people just create a post with “ISO: (product)”, meaning ‘in search of’. Is that what you’re wanting? I don’t have personal experience with it, but I’ve seen it on posts. I assume it was automatic? Hi, is there a way to get a notification when something that I’m searching for comes available,? Craigslist apps do this, and I’d love it if FB would, too. I like to be the 1st to know, but I can’t be on FB all day. I haven’t seen that kind of functionality in the Facebook marketplace yet, but you’re right that would be great to get a heads up!